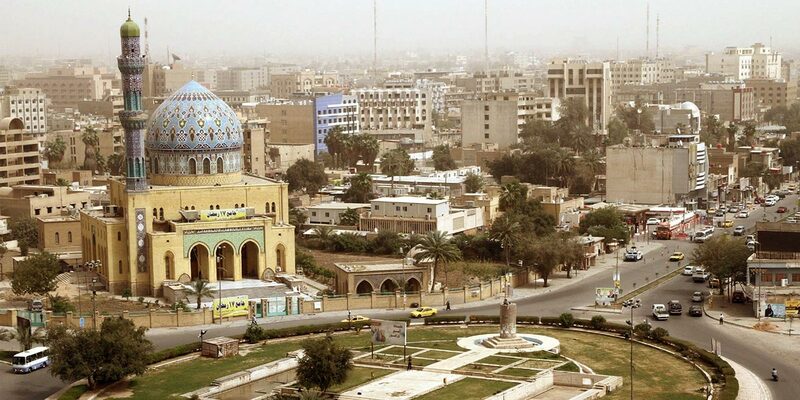 The city of Baghdad felt shaking from today’s series of earthquakes along the Iran-Iraq border. 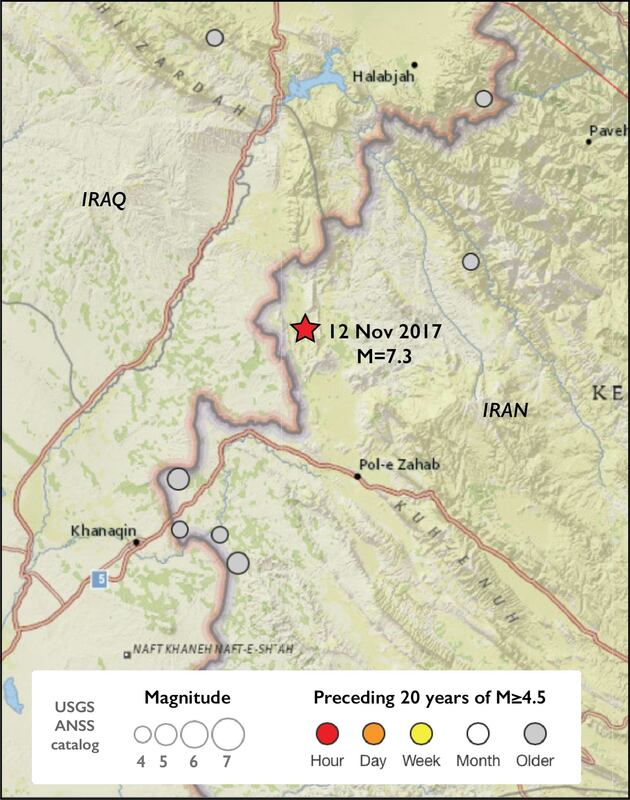 This morning, ten M=4.0+ earthquakes struck the Iran-Iraq border. The largest of these, a M=5.5 near the Iraqi city of Mandali, was also widely felt in Baghdad. Because the area around the epicenter is sparsely-populated, there are no reports of major damage, though five people were injured. However, some more minor damage has been seen close to the epicenter (see below). These earthquakes come less than two months after a M=7.3 quake struck less than 150 km to the north. That earthquake killed over 500 and destroyed numerous buildings. This Google Earth image shows USGS locations of the series of earthquakes to strike the Iran-Iraq border this morning. Based on the USGS focal mechanism, this morning’s earthquakes were compressional in nature. This compression is due to the collision of the Arabian and Eurasian plates at a rate of approximately 24 mm/yr. This collision is also responsible for the formation of the Zagros Mountains, which extend through both Iran and Iraq. Today’s quake struck along the southern edge of the Zagros Mountains. 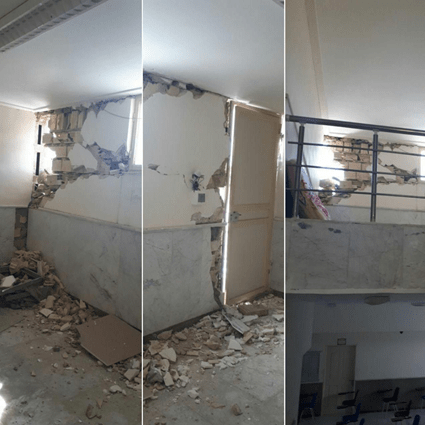 Damage caused by thing morning’s earthquakes along the Iran-Iraq border. At this stage, it is not clear whether these earthquakes are remote aftershocks of the M=7.3 in November, or isolated events. Nonetheless, that have brought further shaking to the border region. This area was last strongly shaking when a M=6.1 earthquake in 1967 hit the area. From the Global Earthquake Activity Rate (GEAR) model, which is available in Temblor, we can see if these earthquakes should be considered surprising or not. This model uses global strain rates and the last 40 years of seismicity to forecast what the likely earthquake magnitude is in your lifetime anywhere on earth. In the figure below, one can see that around this morning’s earthquake, a M=5.5+ is likely in your lifetime. Therefore, these quakes, while a reminder of the region’s seismic hazard, should not be considered surprising. This Temblor map shows the Global Earthquake Activity Rate (GEAR) model for much of Iran and Iraq. This shows how today’s earthquakes should not be considered surprising, as M=5.5+ quakes are likely in your lifetime. 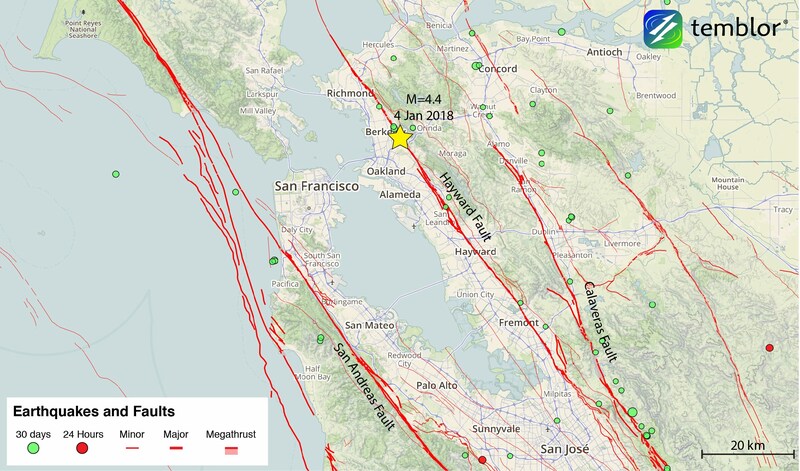 Last night’s M=4.4 earthquake beneath Berkeley was felt by approximately 10 million people across the entire Bay Area. 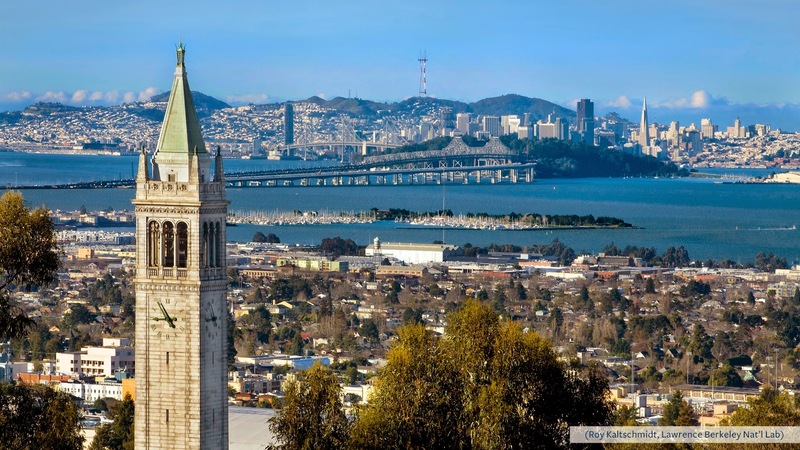 The quake struck along the Hayward Fault, which has a 29% of rupturing in a large magnitude earthquake in the next 30 years. 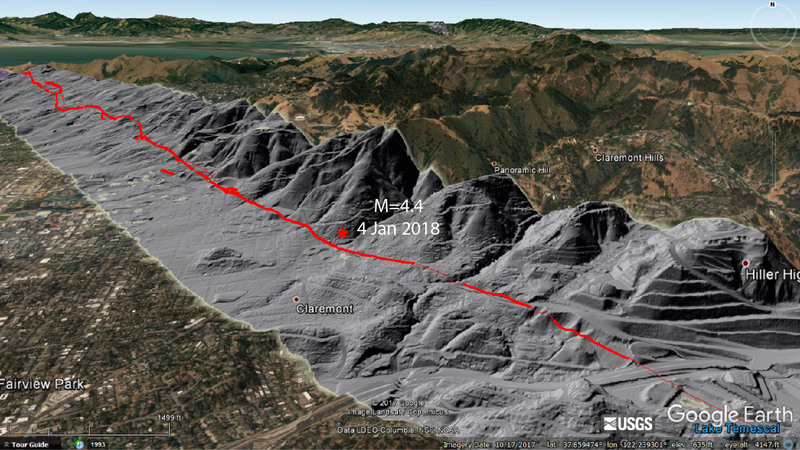 This Temblor map shows the location of last night’s M=4.4 earthquake beneath Berkeley. 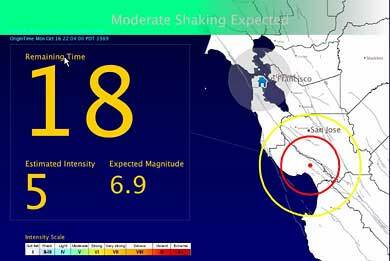 Despite its moderate magnitude, shaking was felt over the entire Bay Area. On 30 May 2015, a powerful earthquake struck west of Japan’s remote Ogasawara (Bonin) island chain, which lies more than 800 kilometers south of Tokyo. 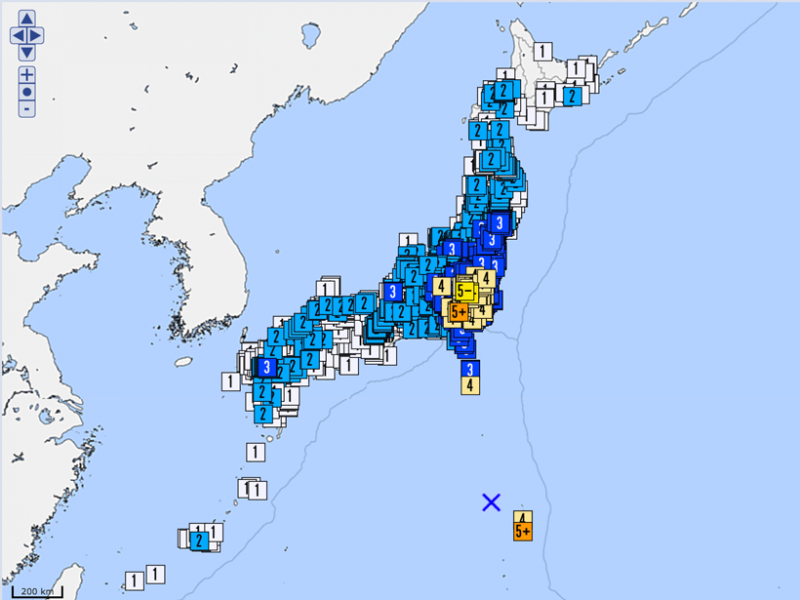 Although it caused little damage, the magnitude 7.9 quake was noteworthy for being the deepest major earthquake ever recorded—it occurred more than 100 kilometers below any previously observed seismicity along the subducting Pacific Plate—and the first earthquake felt in every Japanese prefecture since observations began in 1884. The 680-kilometer-deep earthquake was also notable for its unusual ground motion. 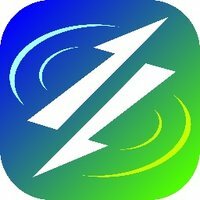 Instead of producing a band of high-frequency (>1 hertz) seismic waves concentrated along northern Japan’s east coast, as is typical for deep subduction-related earthquakes in this region, this event generated strong, low-frequency waves that jolted a broad area up to 2,000 kilometers from the epicenter. To explain this uncharacteristic wavefield, Furumura and Kennett [Journal of Geophysical Research] analyzed ground motion records from across the country and compared the results to observations from a much shallower, magnitude 6.8 earthquake that occurred within the Pacific slab in the same area in 2010. The results indicated that the peculiar ground motion associated with the 2015 earthquake was due to its great source depth as well as its location outside of the subducting slab. The team found that the ultradeep event was missing high-frequency components and generated milder ground motions at regional distances, whereas the 2010 earthquake included the high-frequency components but was narrowly focused. After contrasting three-dimensional numerical simulations of seismic wave propagation from both events, the researchers concluded that waves originating from a deep source outside of the slab can develop a distinctive, low-frequency wavefield as they interact with continental crust and the region’s subducting slabs. Because this wavefield is usually concealed by higher-frequency, slab-guided waves, the few existing examples of this phenomenon will likely provide valuable information on local crustal structure and, in the case of the 2015 Ogasawara event, the morphology of the Pacific Plate. A powerful, shallow earthquake struck along the Iraq-Iran border today. 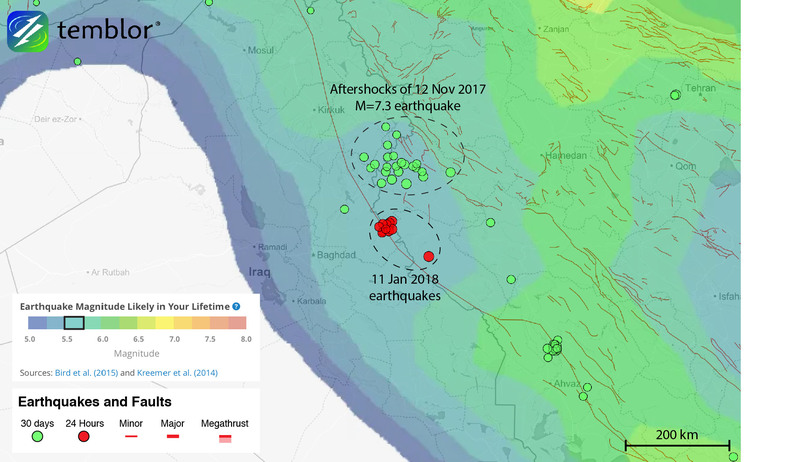 Damage is currently largely unknown, but is likely heavy because of the poor capacity of rural housing in this region to resist seismic shaking. This was tragically demonstrated when the 2003 M=6.3 Bam, Iran, earthquake took 26,000 lives due to the almost complete collapse of ancient adobe dwellings. Also, a M=5.3 aftershock hit 10 minutes after the mainshock, which is large enough to bring down a building damaged by the first event. 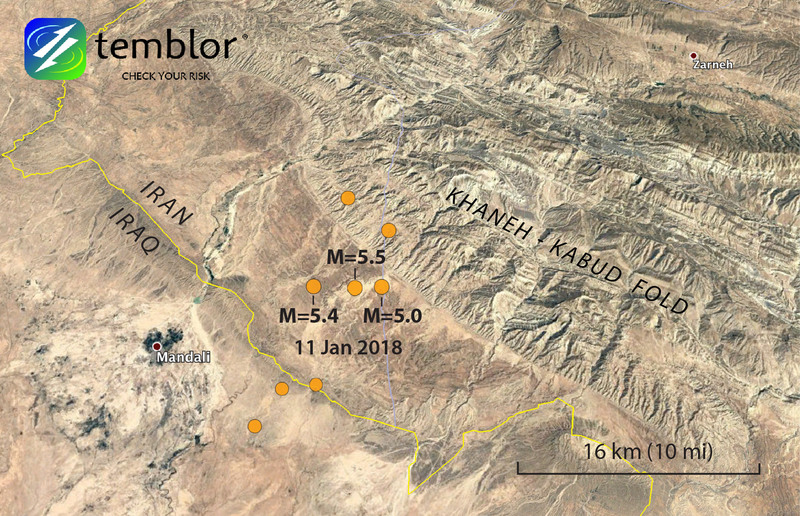 Although both Iraq and Iran are seismically active, and even though the quake lies only 100 km (60 mi) from the compressional boundary between the Arabian and Eurasian plates, there were no M≥4.5 quakes within about 60 km (35 mi) of today’s epicenter during the past 20 years. The completeness magnitude for this region is likely about M=4.5 since 1997, and so we use those to assess the background, or preceding seismicity, and find it to be very sparse. Nevertheless, unless the EMSC catalog suffers from timing errors, there was a M=4.3 ‘foreshock’ one hour before the mainshock, located about 60 km (35 mi) to the southwest of the future mainshock. Given how low the background rate is, this occurrence might indicate that the gently-dipping thrust fault on which the mainshock struck was undergoing precursory creep. The occurrence of foreshocks is rare, and as indicators of future mainshocks or even creep, unreliable. The foreshock struck rather far from the mainshock, but could indicate deep precursory creep. Is this a very rare event? According to the ISC-GEM seismic catalog, the closest large events since 1900 were a pair of M=6.7 and M=6.8 events in 1957-1958, some 200 km (120 mi) to the southeast of today’s mainshock. Broadly, the Arabia tectonic plate is being shoved against Eurasia plate along the Bitlis Suture and Zagros fold belt at a speed of 26 mm/yr (1 in/yr). 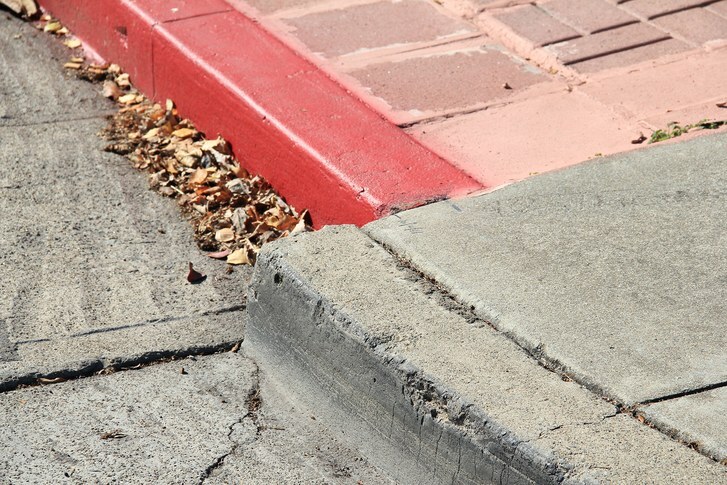 This is the same slip rate as the San Andreas Fault. But because the almost no M≥5.8 quakes struck in this region for the past 40 years, and the because local strain rate is not adequately measured by GPS, the Global Earthquake Activity Rate (GEAR) model shown in Temblor expects only a M=5.5-5.8 in a typical lifetime in this area. But the political and military conflicts in the region have prevented adequate GPS monitoring. Today’s earthquake sequence struck along two borders: political and tectonic. So, either this event is indeed quite rare, or the absence of GPS data has created artificial quake ‘hole’ in the GEAR model. The U. S. Geological Survey (USGS) along with a coalition of State and university partners is developing and testing an earthquake early warning (EEW) system called ShakeAlert for the west coast of the United States. Long term funding must be secured before the system can begin sending general public notifications, however, some limited pilot projects are active and more are being developed. The USGS has set the goal of beginning limited public notifications by 2018. Studies of earthquake early warning methods in California have shown that the warning time would range from a few seconds to a few tens of seconds, depending on the distance to the epicenter of the earthquake. For very large events like those expected on the San Andreas fault zone or the Cascadia subduction zone the warning time could be much longer because the affected area is much larger. ShakeAlert can give enough time to slow and stop trains and taxiing planes, to prevent cars from entering bridges and tunnels, to move away from dangerous machines or chemicals in work environments and to take cover under a desk, or to automatically shut down and isolate industrial systems. Taking such actions before shaking starts can reduce damage and casualties during an earthquake. It can also prevent cascading failures in the aftermath of an event. For example, isolating utilities before shaking starts can reduce the number of fire initiations. The USGS will issue public warnings of potentially damaging earthquakes and provide warning parameter data to government agencies and private users on a region-by-region basis, as soon as the ShakeAlert system, its products, and its parametric data meet minimum quality and reliability standards in those geographic regions. The USGS has set the goal of beginning limited public notifications by 2018. Product availability will expand geographically via ANSS regional seismic networks, such that ShakeAlert products and warnings become available for all regions with dense seismic instrumentation. The West Coast ShakeAlert system is being developed by expanding and upgrading the infrastructure of regional seismic networks that are part of the Advanced National Seismic System (ANSS); the California Integrated Seismic Network (CISN) is made up of the Southern California Seismic Network, SCSN) and the Northern California Seismic System, NCSS and the Pacific Northwest Seismic Network (PNSN). This enables the USGS and ANSS to leverage their substantial investment in sensor networks, data telemetry systems, data processing centers, and software for earthquake monitoring activities residing in these network centers. The ShakeAlert system has been sending live alerts to “beta” test users in California since January of 2012 and in the Pacific Northwest since February of 2015. In February of 2016 the USGS, along with its partners, rolled-out the next-generation ShakeAlert early warning test system in California. This “production prototype” has been designed for redundant, reliable operations. The system includes geographically distributed servers, and allows for automatic fail-over if connection is lost.